Why did the Phillies lose the World Series? There are many answers to that question (none of which is that we were beaten by a better team). I might be a bit biased, but it sure looked as though it was more a product of the team not playing up to its capabilities as it was the Yankees winning the series. 1. The offense did not take advantage of Pettite. By far the most troubling thing to me about this series was the fact that we did not hurt Andy Pettite. I'm sure he would be the first to tell you that he did not have his best stuff in either game. He was behind many hitters and gave up 8 walks in 11.2 innings. Normally the Phillies will destroy a pitcher like that, but not this time. It is really frustrating when a guy is able to work out of jams time and time again and get away with it. We got to him somewhat in game 3 early on, but once he got the lead he just dominated our hitters. Those are the games we needed to win. Everyone knows about Cole Hamels, so I will keep this brief. He had a 3-0 lead and threw three perfect innings. Things looked awfully good at that point. Even when A-Rod hit the homer off the camera it was fine. Then he imploded and Andy Pettite embarrassed the Phillies after that. That really changed the whole complexion of the series. The fact that Manuel decided to pitch Pedro in game 2 says enough. How different might this series have been if Brad Lidge had struck out Damon on the foul tip in game 4. I felt so good at that point. Pedro Feliz had tied the game in the eighth and Lidge made all three batters look foolish in the ninth. Then Damon got a hit. Big deal. Then he stole second. No problem. And third. The Yankees still needed a hit to score a run. But then Lidge abandoned his slider. It would have been devastating if a wild pitch scored a run, but you have to trust your catcher and throw your best pitch. But he threw fastball after fastball to A-Rod and Posada and that was it. The Damon play was bad, the Rodriguez hit was worse, but he simply could not allow any more damage. After Posada's hit, the game was over. I consider Howard's difficulties (including his record 13 strikeouts) nothing more than a product of a slump. You've seen Howard in a slump and realize how awful he looks on sliders and how great he can be when he is hot. It just wasn't there for him. But it really hurt the Phillies to have such a gaping hole in the heart of the lineup. But I will give him credit. His home run in the final game could have been the spark the team needed to make an incredible comment. Nobody has acknowledged this, but Jimmy Rollins may have hurt the team more than anyone. He hit .217 during the series. It is very hard to win when J-Roll is not on base at the top of the lineup. Think back to how many solo homers the Phils hit during the series. If he is on base for even two of those, the entire complexion of the series would have changed. Put all of these together and you have a pretty disappointing series. I will leave you with one thought. 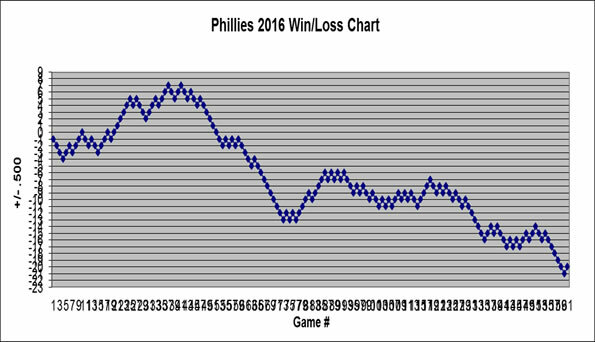 When the Phillies had the chance to close out a series they did it every single time. Those clinching games are the toughest ones to win because you have to reach deep down and give every ounce of yourself when your hear is halfway broken. No other team that we faced was able to find that strength except one: the Philadelphia Phillies. They gave us a great ride and the trip aint over yet. Were the Phillies beaten by a better team? A. Because the Yankees were the better team. B. Because the Phillies did not play their best. It is an interesting question. My answer is B for the most part. It must be stated that pretty much all numbers favor the Yankees slightly. They have slightly better pitching and hitting..but only slightly. The only real advantage the Yankees have over the Phils is that they won over 100 games in a superior league in an extremely tough division. It is hard to deny that the Yankees are statistically the better team. But looking at both teams player by player it is a pretty even match. So if you want me to tip my cap and say that we were simply beaten by a better team, it is not going to happen. The fact is the Phillies simply did not play well. They had a three run lead in game 3 that they let slip away and ruined a terrific comeback in game 4. Beyond that, they did not seem to have that real fire and swagger we saw in the past. I really feel that if we played near our capabilities, we should have and would have won the World Series. But they didn't. This Phillies team that had breezed, and I mean really breezed, through the 2008 and 2009 postseason ran into their first roadblock and weren't able to come on top. It's a shame because if a couple things had gone differently, we could have been up 3 games to 1 instead of the other way around. All we can do now is look forward to a team next year that should look much the same as the group we saw here this year. I think Charlie is right: we will be back. The Phillies announced Sunday night they have declined Pedro Feliz's $5.5 million club option for 2010. They will buy him out for $500,000 instead. They say that this does not preclude the team from bringing him back. That definitely is not their plan, but given the small number of third baseman available that would be an upgrade, it still is a possibility. The most common names thrown out as free agent options for the Phillies are Mark DeRosa, Chone Figgins, and Adrian Beltre. Figgins would be the best option for the Phils. His batting average and speed would be a perfect addition to this lineup. DeRosa is a good player with power, but the Phillies have plenty of power and could use some more stability to the lineup. Imagine having Rollins and Victorino at the top of the lineup and Figgins batting in the 7 spot below Werth and Ibanez. Nice. Another interesting option is Polanco. The former Philly is a second baseman by trade, but could play third, as well. I wouldn't be opposed to Polanco, but I would prefer to have a true third baseman. Don't forget, Feliz made a lot of big plays defensively for this team. Feliz hit .266 with 12 home runs and 82 RBIs in 158 games this season. He hit a team-best .336 with runners in scoring position, which ranked 13th in the National League. But his value was in his glove. He played excellent defense for the Phillies for two seasons. Here is the breakdown of the numbers on the possibilities at third. Click here for a list of all free agents on mlb.com. I'm sure you've heard the rumor that the Phillies were considering trading Cole Hamels to the Toronto Blue Jays for Roy Halladay. That would give us a starting rotation of Cliff Lee, Roy Halladay, Joe Blanton, J.A. Happ, and Jamie Moyer. Two Cy Young award winners, one ageless wonder, and a near Rookie-of-the-Year. Wow! Now I am going to explain why we should NOT make that deal. #1 Do you want to be the Yankees? I might have lost some of you already, but I am serious. Do you really want a team that buys championships? Believe me, I want another championship as much as anyone, but I want to feel like we earned it. Just going out and emptying your pockets...what fun is that? The Phillies' ownership is doing pretty well for themselves these days, but they are not the Steinbrenners. If we get Roy Halladay, we simply will not be able to keep together the everyday players we love so much. Do you still think it is worth it to rent Halladay and give up your future for one championship? If Ruben Amaro sits down and truly believes that the Cole Hamels we saw last year is the real Cole Hamels, then this might be a good trade and I would be behind him 100 percent. However, if he thinks the best is still ahead of Hamels, this is a trade that could haunt you for 15 years. Halladay will turn 33 next season and may only give you five good years at best before he is finished. Hamels is only 27 and if he is close to his 2009 playoff form, why on earth would you trade him? There is a chance, albeit slight, that he could even be better than Halladay next year. The Halladay deal would be much more enticing if we would be adding him to the rotation, but in this case we would be replacing Hamels with Halladay. When I'm giving up the farm, I hope it is for more than an upgrade. I am not a fan of the Phillies ownership group but I will agree with one thing David Montgomery said: if I have to choose between having a team that competes for a championship every year and a team that wins the World Series and then falls off a cliff, I will take my chances with the first option any day of the week. I lived through the terrible teams before and after 1993 and I don't want to do it again. Who knows how our prospects might turn out, but I don't want to give every single great prospect for one player. There is a reason why nobody got Halladay last year. It's just not worth it. The dream of having Lee and Halladay at the top of the rotation is great. It almost guarantees we will be favorites to win the World Series next year. But I think we can compete and win with the team we have and it gives us a better chance to keep competing for a long time. Now that the 2009 season is over, it is time to look ahead to next year's team...and that means payroll. Before we begin thinking about bringing Roy Halladay to Philadelphia (a move I am not a fan of), we need to put ourselves in the shoes of Ruben Amaro. The Phillies opening day payroll last year was $130,844,098. It will need to be at least that much to keep most of the pieces in place for next year. The above anticipated roster gives a combined payroll of $128,476,400. That is very close to last year's payroll, but the Phillies still need to fill 5 roster spots that include a third baseman and 4 relief pitchers. If you assume spending $5 million on a third baseman (which is what Feliz was scheduled to make) and $1million each for your bench, the 2010 payroll would be around $138 million.